The development of a high-end building in London has been installed with 900 of Luxonic Lighting’s chilled beam luminaires. One Pancras Square is a part of the King’s Cross development and accommodates offices over eight floors, including the new head office for French Fashion designers Louis Vuitton. The Grade A office building has been rated BREEAM ‘Outstanding’ and is installed with the latest technology to minimise environmental impact and reduce running costs for its occupiers. Widely regarded as the most space and energy efficient method of heating and cooling a building, the chilled beam systems increase the design and sustainable potential of projects. Luxonic’s Airlux is a range of satin lensed small nose cone luminaires that have been specifically developed for seamless integration into chilled beam structures to provide controllable light outputs that achieve the optimum lit environment. The Airlux range has been adopted for passive and active multi-service chilled beam systems (MSCBs) across a variety of projects but most notably in commercial office developments. Supplied as a standard with DALI dimmable control gear, the satin lens provide asymmetric upward and downward light to large open offices areas while eliminating uncomfortable glare. Available with square edged and bullnose lens versions, the Airlux is versatile to accommodate the specific requirements for design led projects. The Airlux luminaires have been used on MSCBs in fit outs of many commercial office developments which benefit extensively from the integration of low energy lighting with the air conditioning and heating services of the chilled beams. The innovative technologies used to create the various chilled beams aim to reduce energy consumption and improve comfort for the occupants by lowering the potential for draughts and cutting out the intrusive noise and using Luxonic’s efficient Airlux luminaires adds to the savings. 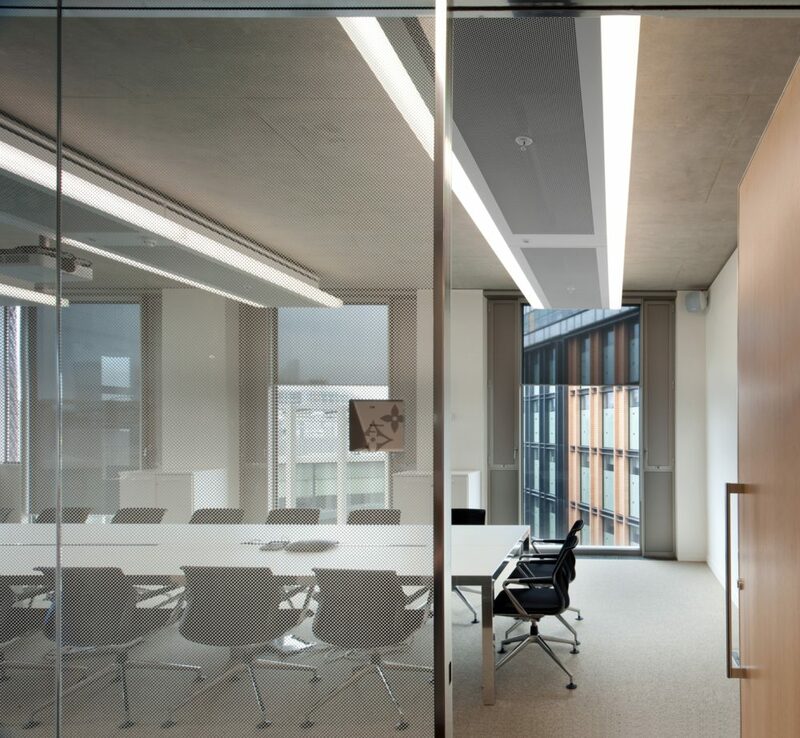 The Airlux luminaires have been a popular choice for MSCB installations in commercial office projects such as One Pancras Square, primarily for its efficient lighting distribution as well as sustainability. The advanced technology of the Airlux is well matched to the environmental credentials of the building development. As a part of a two million sq ft cluster of office buildings, One Pancras Square is on the doorstep of Kings Cross and St Pancras train stations as well as having great accessibility to the London Underground, with an entrance situated within the building itself. Pancras Square has an immense range of cafes and shops as well as a public leisure centre and library making it the perfect place for office workers to have lunch, socialise and relax.